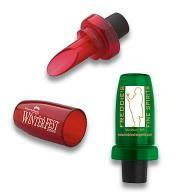 With your firm imprint or logo, our promotional wine accessories, make great promotional items. 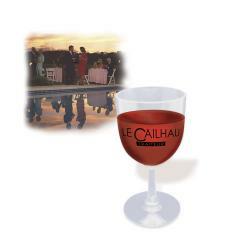 See our wide choice of wine accessories below. These items will make a big impression to promote your business by advertising with promotional products.. This means that everyone will see the wine accessories with your company imprint or logo, use them, and think of your firm when they need your product or business. It is also a great way to promote a specific event. Lowest price starting at: $2.38 each. 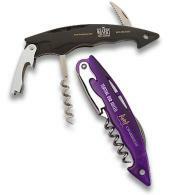 Description: Sleek, soft-feel design features a sturdy corkscrew and durable lever. Handy cutter blade slices through most stubborn foils. There is a 6% surcharge on orders shipped to California. Lowest price starting at: $0.99 each. Description: Efficiently pours wine! Rubber insert easily slides into bottle to secure spout. Separate cap attaches to spout for storing. There is a 6% surcharge on orders shipped to California. Lowest price starting at: $2.00 each. Description: *Strong, heavy-duty construction. *Serrated foil cutter. *Chrome plated lever and bottle opener. *Rigid metal corkscrew. *Actual size 1-1/4�h x 5�w. Lowest price starting at: $0.82 each. Description: *Insert plastic cap through handle for easy turning. *Strong, durable metal corkscrew. *Actual size 4-1/2� long. Description: Molded in rugged, SAN plastic for indoor or outdoor enjoyment. Dishwasher safe. Use again and again! ; With a universal design and a capacity of over six ounces, you can taste and toast with red or white wine; Individually poly bagged. Description: Easily open wine bottles with Teflon corkscrew and double hinge lever. Features foil cutter blade and soft rubber grip edges. There is a 6% surcharge on orders shipped to California. 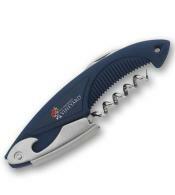 Description: Sturdy corkscrew and lever allow easy opening of wine bottles, and a durable, cutter blade cleanly slices through most stubborn foils. There is a 6% surcharge on orders shipped to California.